Thanks to highly-publicized health benefits, acai has taken the health world by storm. Read on to learn more about this tropical fruit. The acai tree traces its roots to tropical Central and South America, growing naturally mostly in the Amazon Basin of Brazil and Peru. The acai berries have been a staple for the inhabitants of these regions for millennia, and they still make an important part of their daily diet and traditional medicine. Decreasing inflammation. Acai's seems to inhibit chemically reactive molecules that contain oxygen, reducing oxidative stress and reversing inflammatory processes. Reducing the risk of metabolic disorders. A metabolic disorder occurs when some organs, such as your liver or pancreas, stop functioning normally. The antioxidant content of acai may help treat and prevent obesity, diabetes, and other related conditions. Balancing cholesterol levels and blood pressure. 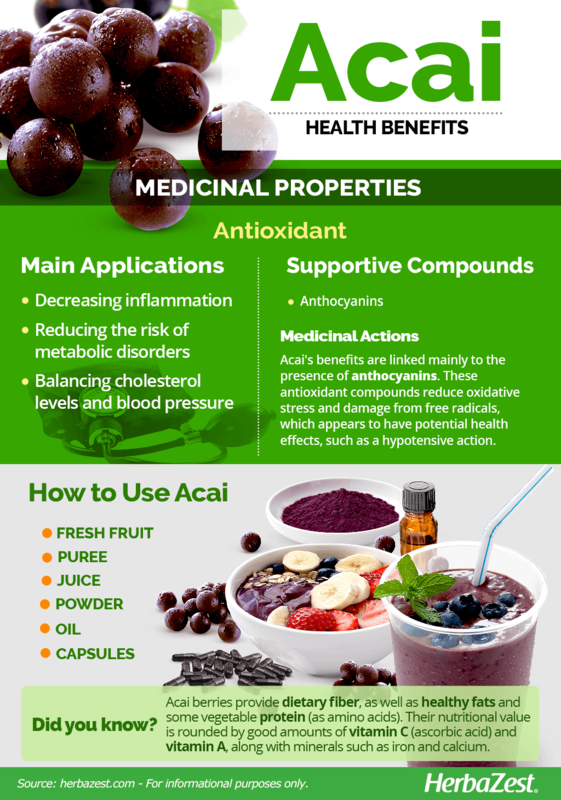 Clinical studies suggest that acai may help in the treatment and prevention of hypertension, as well as in regulating cholesterol, probably through a vasodilator and antioxidant activity. In Brazilian herbal medicine, acai fruit is used to treat diarrhea, jaundice, skin ulcers, and fever, while in the Peruvian Amazon it is used for malaria, diabetes, liver disorders, hair loss, hemorrhage, and kidney diseases, as well as menstrual and muscle pain. The main compounds in acai are anthocyanins - antioxidants that also give the fruit its dark hue -, as well as flavonoids, polyphenols, and sterols. Based on preliminary research, it is thought that acai's benefits are linked in part to the antioxidant ability of its anthocyanins, though it is likely that additional, unidentified compounds also contribute. These antioxidant compounds reduce oxidative stress and damage from free radicals, which appears to have potential health effects, such as a hypotensive action. Other herbs with antioxidant properties are blueberry and cacao. 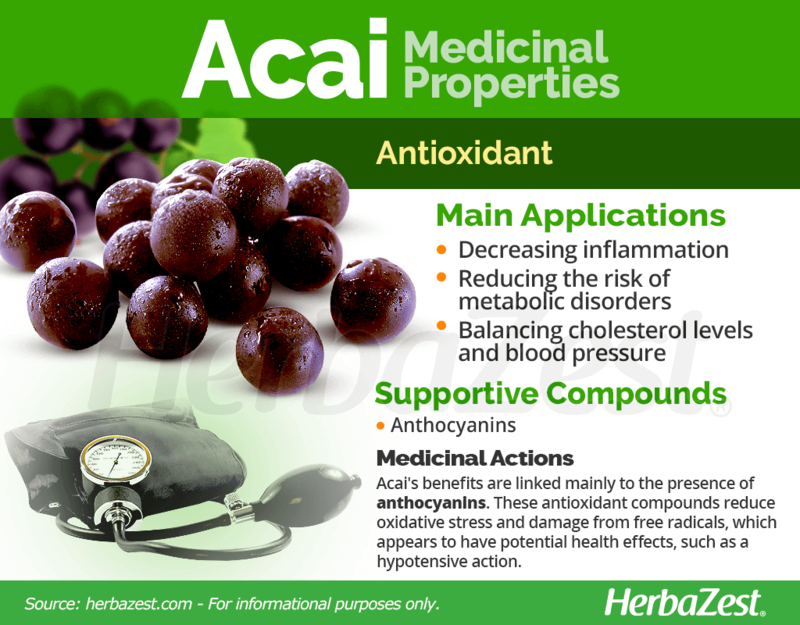 There are no reports on side effects or adverse reactions from acai berry supplements. However, people allergic to acai or members of the Arecaceae family should avoid any form of these berries. A few, rare cases of American trypanosomiasis (Chagas disease) have been linked to raw acai juice. Chagas disease is a serious parasitic illness, endemic to the regions in which acai berries are cultivated. For safety, it's best to buy only pureed acai berries or pasteurized juice. Acai may increase the risk of hypoglycemia. People with diabetes or using medications to low blood sugar should consult with a doctor before consuming acai. Due to its strong antioxidant, immune boosting porperties, acai may reduce the effects of immunosuppressant agents. Patients under treatment for autoimmune disorders should avoid its consumption. Due to lack of sufficient data, women who are pregnant or breastfeeding should avoid acai consumption. The acai berry not only provides antioxidant effects, but also offers a good deal of dietary fiber, as well as healthy fats and some vegetable protein. 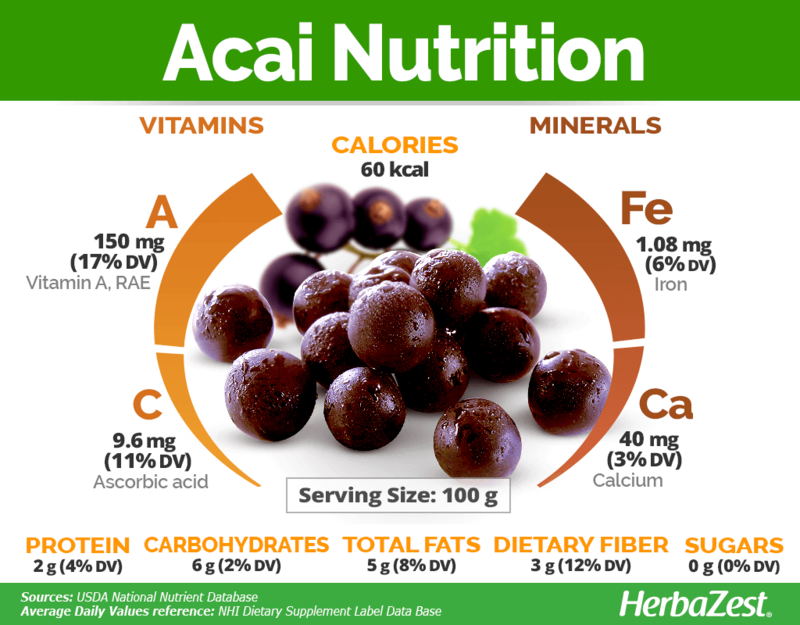 When it comes to acai's nutritional value, good amounts of vitamin C (ascorbic acid) and vitamin A (as beta-carotene) promote the health of the immune system and the skin, greatly contributing to acai's increasingly popular anti-aging qualities, rounded by adequate levels of iron and small quantities of calcium. 100 grams of pure acai pulp provide only 60 calories, as well as 12% of the daily value for dietary fiber. While consuming acai as a snack or in juices is fairly common in the areas where it grows, due to the risk of diseases when taking it fresh, pasteurized pulp and supplements are generally considered safer, and more effective when it comes to reap the medicinal benefits of this exotic berry. Fresh. Acai fruit is usually eaten as a snack in its native regions, and that's a great way to collect its health benefits, and enjoy its particular flavor of wild berries with a hint of chocolate. Puree. Due to safety concerns about fresh acai berries, frozen acai puree is the most popular way of consuming this tropical fruit and reap its antioxidant benefits. Juice. The most common use of acai is as a health-enhancing beverage. Juices, smoothies, and shakes are wont to feature the berry, usually in combination with other similar fruits such as blueberry and blackberry. Powder. The dry freezing process used to produce acai powder preserves its nutrients and medicinal actions. It is a great source of antioxidants, fiber, and omega fatty acids. Oil. 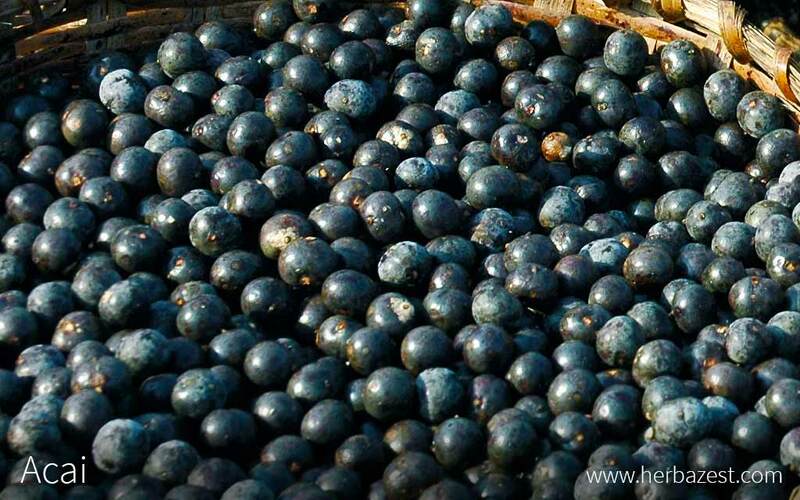 Acai berry oil is obtained by cold pressing the pulp of the fruit. Due to its content of healthy fatty acids, mainly Omega 3, Omega 6, and Omega 9, acaí oil is often marketed as an anti-aging product, and used topically in order to promote skin health. Capsules. The antioxidant capacity of acai is potentiated in capsule form, due to a high content of polyphenols. However, concentrations may vary depending on the commercial brand. Since trees and fresh berries are restricted by their tropical rainforest climate, it can be difficult to find raw acai outside of its native regions. More widely available options come in pasteurized pulp, juices, and powder which can be found in some supermarkets as well as most health food stores. Acai capsules are carried in many grocery stores and supermarkets, as well as health food stores, and online retailers. Continued consumer demand is a strong incentive for vendors to keep them in stock, though buyers should be wary of mislabeled supplements and false advertising. The acai palm is most commonly found in regularly flooded regions of rainforest and often forms large groves along lowland river edges. This slow-growing, shade loving palm takes 4 – 5 years before it begins to produce fruit. It depends on the many birds and animals that eat its fruit for the majority of its seed dispersal throughout the forest. Domestic cultivation of acai is not common practice, since this tree requires tropical temperatures to develop properly – a temperature range of 63 – 91°F (17 – 33°C) is ideal. Heavy organic matter, such as that found on the rainforest floor, is also essential to healthy growth, as is periodic water-logging of the soil, which should have a pH range of 4.5 – 7.0, toward slightly acidic. Heavy humidity and rainfall between 51 – 118 inches (1,300 – 3,000 mm) also aid in keeping the plant hydrated. In their natural habitat, trees grow together in clusters. Each tree stem will produce 4-8 bunches of fruit each year, each bunch weighing close to 13 pounds (6 kg). Acai harvest takes place during the dry season, between July and December. The slender palm of acai naturally grows in shaded areas of the rainforest, reaching heights of 50 - 100 feet (15 - 30 m). It is a multi-stemmed palm, with the average adult tree having 4 - 8 stems converging into a single root system. The tree displays a beautiful crown of green feather-like palm leaves and produces bunches of nutritious berries that are approximately 0.5 inches (1.5 cm) in diameter and contain a single seed in the center. The berries emerge green, and become dark purple when ready for harvest. Acai, scientifically called Euterpe oleracea, is a member of the Arecaceae family, which features roughly 2,600 species more colloquially known as palm trees, most notably coconut and dates' palm. Though acai is the most visible plant of the Euterpe genus, other South American palms are closely related. There are two main varieties of acai trees, though their characteristics are much the same apart from fruit production. The most common type found worldwide is the BRS-Para Dwarf acai, which was developed by the Brazilian Agricultural Research Agency. It is significantly shorter in height and yields larger fruit in a shorter period of time. On the other hand, the Branco acai is much rare. It can be found in Amazonian estuaries, its berries remain green even when ripe and some report them to have a superior taste. Amazonian tribal societies have depended upon the acai palm since pre-Columbian times as a food source and building material. In the Tupian language of the region, the tree was first known as ïwaca'i, meaning "fruit that cries." This was due to the fruit's juicy quality that nourished foragers before agriculture was feasible. It was later adapted by Portuguese settlers as the name in use today. These days, acai crop cultivation is a major industry for South American countries both domestically and abroad, with Brazil leading berry exportation in 2006, selling 101,000 tons valued at $47 million USD. Approximately 30% of that figure was sold to the U.S. This spike in popularity can be attributed to its high ranking on the now-withdrawn ORAC (oxygen radical absorbance capacity) list, which formally stated its antioxidant saturation level and influenced public demand. Handcrafts. Acai palm leaves can be made into hats, baskets, and much more. Construction. The palm fronds of acai are used to help thatch roofs, and its particularly pest-resistant trunk wood is used for building shelter and furniture. Dye. Acai is also used to produce a natural dye, make ice cream, liquor, and a variety of sweets. 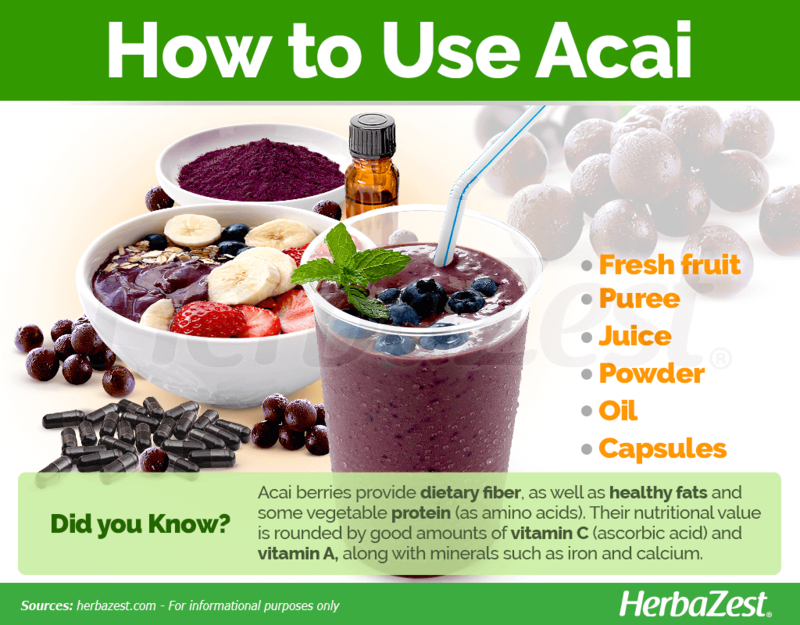 Not easy to come by in its raw form, the numerous benefits of acai can be reaped through a variety of products. Even when its availability still limited, this exotic fruit is becoming increasingly popular as science has just begun to uncover its medicinal properties.